Hello, Campers! It’s almost the weekend, and I can tell you it’s been a busy week! As I mentioned in my last post, I did pretty well on Tuesday at my writing session with M. Last night I did attempt to write, but I was in my comfy place and the distractions around me proved too hard to resist. So after a measly 148 words, I called it a night and spent the evening streaming Netflix after discovering the wonders of wifi that reaches to all corners of your cabin instead of stopping at the doorway to your bedroom. Now today was much more satisfying on the writing front. As I didn’t have plans to meet up with friends at lunch, I took the opportunity to write and came in with a respectable 605 words, which is one day’s worth and a little bit. I also decided to avoid the hassle of the traffic crawling by outside my workroom window and stayed at my desk to see if I couldn’t build on my earlier progress. With the help of my novel’s playlist soothing me through my earbuds, I ended with a nice daily total of 2,000+ words. Woo hoo! I’ve got another work session with M on Saturday, but I also have the chance to write tomorrow as well so stay tuned! Hello again, my friends. I’ve emerged from my cabin for another day of writing after having hidden myself away for a couple of days. Sunday was a little more traumatic than expected as I ended up spending time hiding under my bunk bed during the the tornado warning and thread of damaging winds that blew through Austin that morning. Once the threat had passed, I decided an afternoon binge marathon was in order and immersed myself in catching up with the episodes of “The Flash” including the awesome “Duet” that I’ve seen at least four times now since it aired. Monday was a work day, and a busy one. It ended with the last of my birthday dinners at Maggiano’s (mmm, calamari) and sorting all the lovely new Prismacolor colored pencils I’d gotten as a gift from the parents. My new owl Oliver kept me company, as did Molly. Fortunately, I’d already planned to meet up with my BFF for a camp writing work session tonight, and I wrote much better than I did on Saturday. I even managed to play catch up and get ahead of the game. You know, it’s so much easier to have a word count goal of 500 words a day instead of the 1,667 in November. It’s also so easy to get ahead that I’ll have to be careful that I don’t slack of in the interim. Well hello there, old friends! I would love to tell you I’ve been so busy writing that I just haven’t had the time to blog, but alas ’tis not the case. After November, I took a short break as is my norm, and then things went KABOOM. My long-time boss retired, the annual year end processing project seemed to develop quirk after quirk thus driving all of us to the edge of insanity, and to top it off my best friend left the company, leaving a huge hole in my world. Not to mention a hellish allergy season, worrying about my cat (she’s got kidney disease) and a wicked bout of winter blues. So things have been off for a while and I just couldn’t find the motivation to write. My current Camp NaNoWriMo bullet journal page (click to enlarge); banner courtesy of NaNoWriMo and bookshelf courtesy of Boho Berry aka Kara Benz. 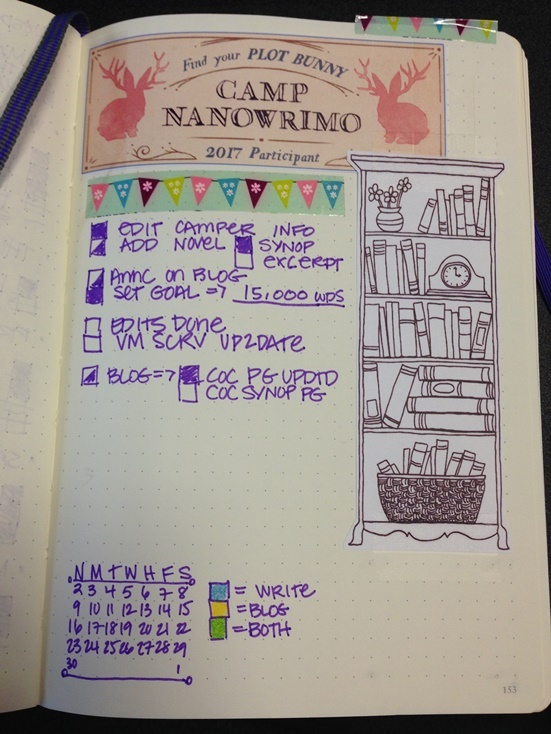 finish up my bullet journal Camp page(s)–as you see from the snapshot, I’ve already added the official Camp plot bunny banner (so awesome) and Kara’s bookshelf that I’ll use to track my word count (1,000 words/book). I still have a couple of things to add like title banners, additional tasks and the like. I do hope to keep you guys up to date with letters home from camp this April, which I neglected to do last summer, so stay tuned. I’ve also tweaked the Curse of Camlann synopsis page, and here’s hoping last year’s COC playlist remains inspiring as it has in the past. I thought you might be curious about the story, so I’ve created a new COC excerpt page and shared a scene written at the end of NaNo. Happy reading and writing, everyone!